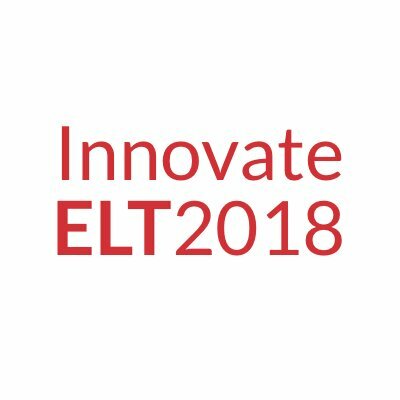 Scott gave two talks at iELT2018, looking at the two sides of the conference theme: Fun? 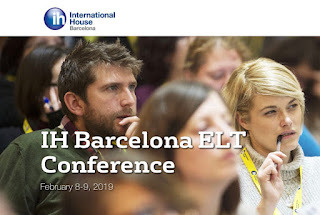 Delight and Struggle in ELT. The first talk (decided by the flip of a coin!) looked at the positive side of having fun in the FL classroom. ‘When I hear my voice I just hate it..............it is not simply that my ears hate my mouth, or my mouth hates my eyes. The inner conflict inhabits my entire being. This makes me feel that my own ‘self’ is falling apart. Now I have two ‘me’s’ inside myself. A ‘me’ with whom I am familiar and with whom I feel connected. The other ‘me’ is a stranger’. Dewaele, J-M. & MacIntyre, P.D (2014). The reduction of anxiety was a central premise of many of the humanist approaches which evolved in the 60s and 70s, perhaps epitomised in the resource book ‘Caring and Sharing in the Foreign Language Classroom’ by Gertrude Moskowitz (1978). Other suggestions for reducing inhibition and anxiety also include the consumption of an optimal amount of alcohol, which resulted in an improvement in pronunciation (see Ellis, 2008, p. 673). 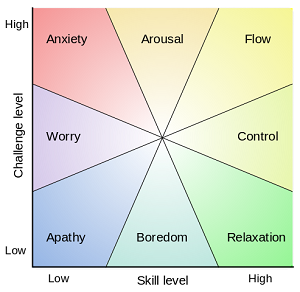 Flow theory, developed by Mihály Csíkszentmihályi in 1975, suggests that when there is an optimal proportion of skill versus challenge, wherein learners can enter a state of ‘flow’: a feeling of being ‘in the zone’, when you don’t notice the passing of time (see graphics below). In an aside, Scott mentioned that this academic would probably be a lot more famous if his name was easier to pronounce. There’s even a YouTube vídeo on how to pronounce his name: roughly /’mi:hai ‘tʃi:ksentmihai/, watch it here. An example of a child learning through play is the case study of ‘Nora’, (Wong Filmore, 1979) a newly arrived Mexican immigrant to the US, aged 9, who was studied as she interacted with other children in the playground in her developing English. Nora was found to engage in ‘syntactic play’, drilling herself in patterns she perceived in the language around her. Humor has an important place in the FL classroom, where institutional practices can be oppressive and where face threats must continually be managed, as students struggle with making meaning in a new language and often before peers where the social stakes are high. Even Communicative Language Teaching (CLT) tends to exclude genres of play such as literature or word play, but if we allow learners a little leeway, they’ll happily play with language and introduce a subversive ‘carnivalistic’ element (Bakhtin, 1929). 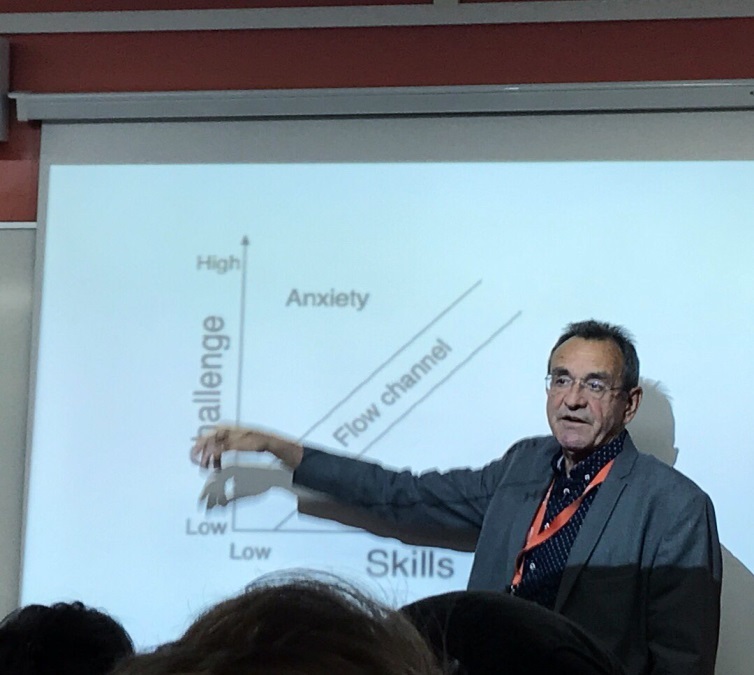 Scott rounded up the first of his talks by pointing out the value of the countable version of ‘play’ in language learning, in other words the use of drama and role play. A study by Galante and Thomson (2017) emphasised the effectiveness of drama as an institutional approach. Scott started this second talk by explaining that the idea of learning a language ‘without tears’ is a long-held and cherished notion. 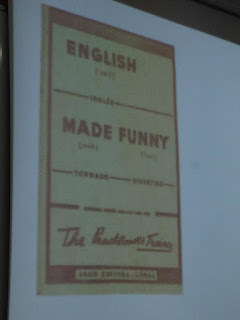 He showed another English coursebook from his methodology collection, entitled ‘Laugh and be merry!’, published in 1939 in Germany (not a time to be merry in Germany). Referring back to Sarah Priestley’s morning plenary (see transcript here) he warned that we should be wary of the ‘happy clappy’ nature of activities which have ‘fun’ as the end goal, hard to avoid considering the pervasive nature of the word ‘fun’ in ELT materials, presentations and online activities. 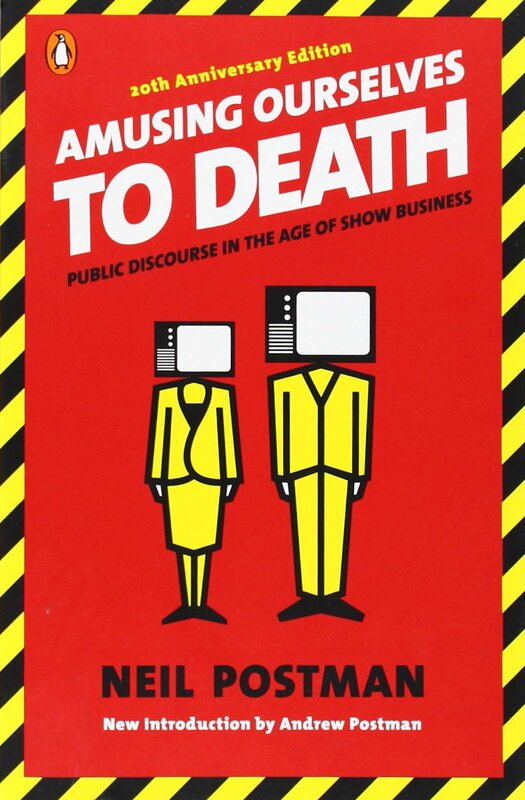 Neil Postman (1985) strongly críticised the use of television in education and the way it dumbs down culture. We don’t learn anything by indulging in fun for fun’s sake. If we use this analogy in the 21st century, we could suggest that computers are good at getting hold of information, but can’t necessarily do anything with it. Surely the point of education is to do something with the information you obtain. The title of this talk: ‘No pain, no gain (redux)’ is based on a presentation Scott gave in the 90s, emerging from his experience working as a tutor on the Dip TEFLA at IH Barcelona with Neil Forrest. Back then, he and Neil noticed that teachers had ‘gone soft’, largely because of the Communicative Approach and the pressure to be hands-off and avoid ‘unwarranted interference’ (see slide below). 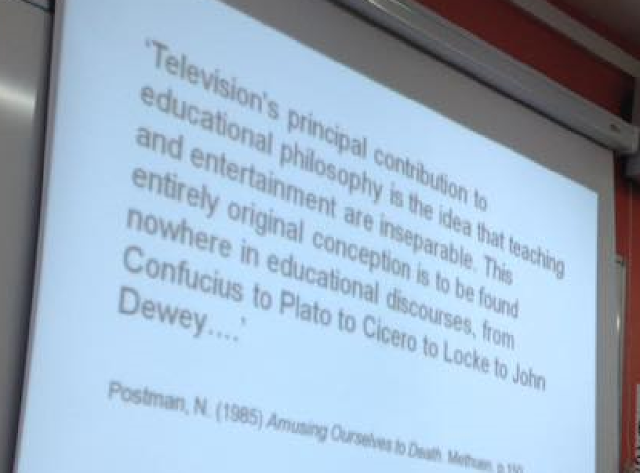 The original version of the talk suggested that teachers take the opposite approach and espoused many of the principles now enshrined in the ‘Demand High’ meme. The non-interventionist approach has been popular since before the advent of CLT. Methods such as Suggestopedia were designed to take the tension out of the classroom, while Krashen advocated lowering the affective filter in order to allow learners to ‘absorb’ the language. More recently, Sugata Mitra, a proponent of ‘minimally invasive’ education, started the ‘Hole in the wall’ project in India, which was based on the principle that children can organise their own learning and teachers are unnecessary (watch his TED talk here): While there is some truth in the observation that children have natural curiosity and a thirst for knowledge, it is controversial, to say the least, to imply that teachers get in the way of learning (especially, as he did, in a plenary at a teacher’s conference in IATEFL in 2014). Scott pointed out that attention is the key to learning and that fun can actually distract from attention and therefore motivation. 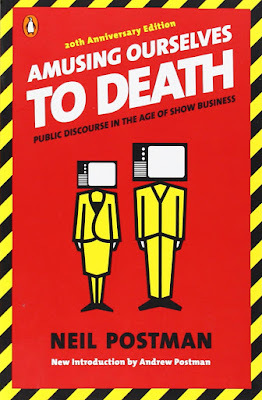 As he put it, ‘attention is the bottom line’ and references Ellis and Robinson (2008:3): ‘What is attended is learned, and so attention controls the acquisition of language itself’. The elements of ‘fun’ that teachers are encouraged to introduce to the classroom may actually be distracting from the learning process. In the Attention Project’, https://lindastone.net/about/ Linda Stone describes how FOMO (Fear of missing out), can mean that the mere presence of a mobile phone, even if turned off, can make people edgy. Similarly, Hal Crowther (2010) claims that students use the internet less to learn and more to distract themselves from learning. We then returned to the idea of Flow: the optimal learning experience, in which ‘challenge’ is the operative word. The learners in the Teaching Practice on the DTEFLA in the 90s were underchallenged, and it was questionable whether they were actually learning anything. 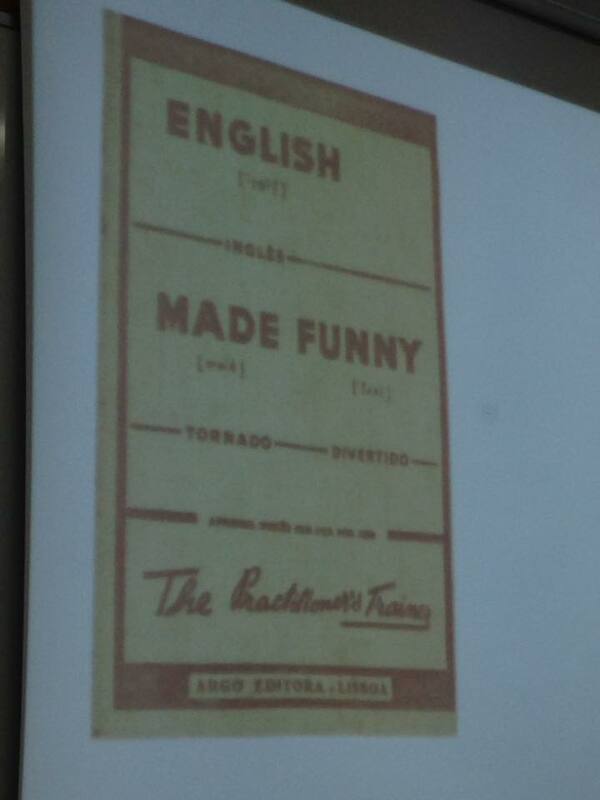 Scott also referenced his own experience of learning Spanish. While massive exposure focuses on content, it is only when you produce that you have to focus on the details, such as verb endings. This was the basis of Merrill Swain’s ‘output hypothesis’ (1993). Learning occurs when a learner’s output is ‘pushed’. 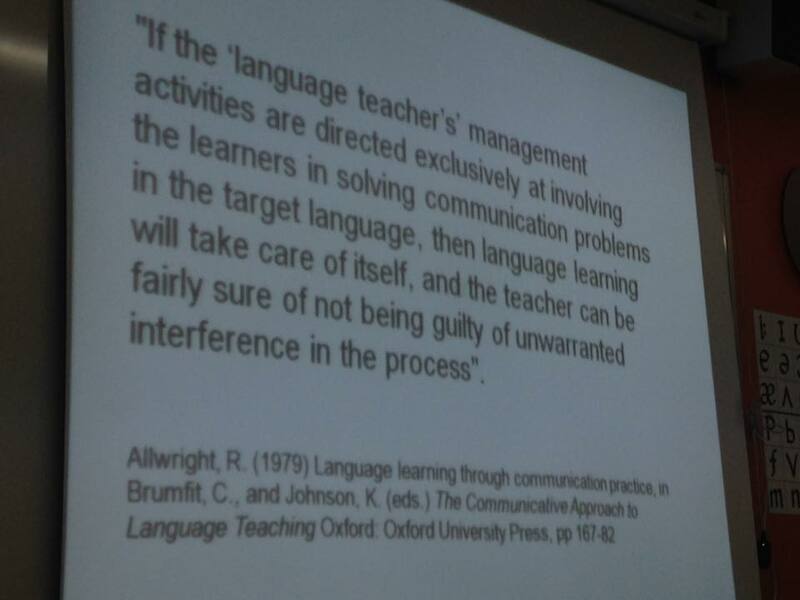 Mike Long refers to this as ‘interlanguage stretching’, which ‘requires learners to operate at the outer límits of their current abilities’ (Long, 1989: 13, in Batstone, 1994: 78).In this way, the teacher can promote ‘approach’ tendencies through ‘facilitating anxiety (Scovel, 1978), rather than the ‘avoidance’ caused by debilitating anxiety. To conclude, Scott suggested that task repetition is the key to ‘pushing’ student output. There are ways to repeat a task so that it doesn’t feel repetitive: change one element each time – e.g. the time allowed ; the place; sitting or standing; recording and videoing the students etc. Using techniques such as the carousel or gallery walk, a group of 24 students can repeat a task up to 12 times, upping the ante with each iteration. Bakhtin, M. (1929). Problems of Dostoevsky's Poetics. Minneapolis, MN: University of Minnesota. Batstone, R. (1994). Grammar. Oxford. Oxford University Press. Dewaele. J.-M., & MacIntyre, P.D. (2014). Foreign Language Enjoyment and Foreign Language Classroom Anxiety. The right and left feet of the language learner. In MacIntyre, P.D., Gregersen, T & Mercer, S. (eds.). Positive Psychology in SLA.Bristol. Multilingual Matters. Ellis, N. C. & Robinson, P. (2008) Handbook of Cognitive Linguistics and Second Language Acquisition. New York. Routledge. Ellis, R. (2008). The Study of Second Language Acquisition.Oxford. Oxford University press. Granger, C. (2004) Silence in Second Language Learning (a Psychoanalytic Reading) Multilingual Matters. Long, M. H. (2016). In Defense of Tasks and TBLT: Nonissues and Real Issues. Annual Review of Applied Linguistics. 36, 5-33. Pomerantz, A. & Bell, N. D. (2011).Humor as a safe house in the foreign language classroom. Modern Language Journal, 95. Scovel, T. (1978). 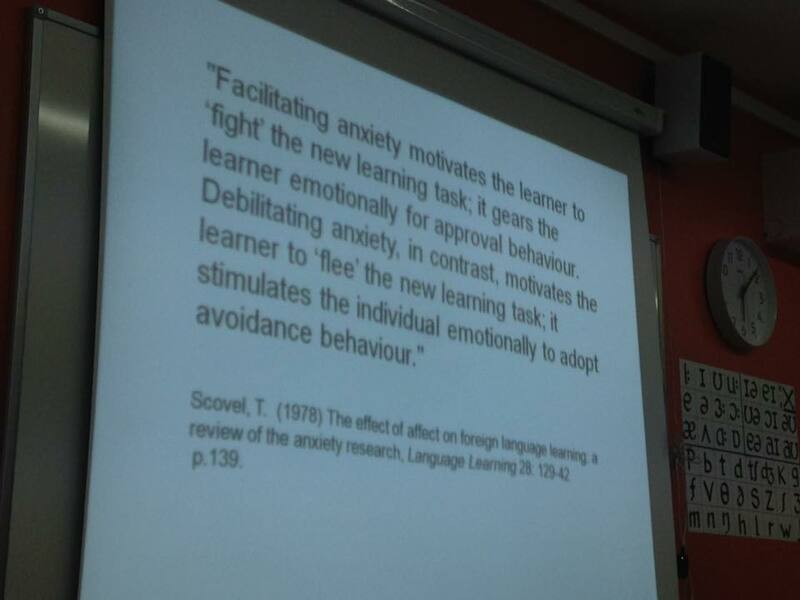 The effect of affect on language learning: a review of the anxiety research. Language Learning 28. Swain, M. (1993). The Output Hypothesis: Just Speaking and Writing Aren't Enough. Canadian Modern Language Review, 50 (1) 158-64. Waring, H.Z. (2013). Doing being playful in the second language classroom. Applied Linguistics, 34 (2), 191-210. Wong Filmore, L. (1979) Individual differences in second language acquisition, in Filmore, C.. Kempler, D. & Wang, W. (eds) Individual Differences in Language Ability and Language Behavior. New York, Academic Press. A great post on a great blog. Thanks for this excellent summary Jessica. "Scott pointed out that attention is the key to learning and that fun can actually distract from attention and therefore motivation. As he put it, ‘attention is the bottom line’ and references Ellis and Robinson (2008:3): ‘What is attended is learned, and so attention controls the acquisition of language itself’. " Scott's assertion has all the unwarranted conviction of a born again Christian quoting the bible. When Ellis & Robinson (2008) say "What is attended is learned" that doesn't mean that nothing is learned unless it is attended; thus the second half of the sentence is a non-sequitur. Not everybody signs up to Schmidt's Noticing Hypothesis, and the role of conscious attention in language learning remains in dispute, partly because the constructs used to discuss it are often so badly defined. Do bear in mind that any issues you have with the argument presented here may have more to do with my deficient note taking and summarizing skills!